Do you ever feel you are sort of stuck in a rut as you breathe in the fumes of a dozen or so vehicles idling at the stop-light ahead of you? Sometimes I wish that our technology was a little more advanced and that I possessed my own personal spaceship instead of an ordinary every-day auto so that I could just escape out of there. In its own way, the X Series gives me a chance to somewhat live out those otherwise unreachable dreams. I’ve been playing the X Series since the very first game way back in the day: X: Beyond the Frontier. After playing that I sought out all the other games I could in my pre-Steam life. Now with the advent of Steam, I have recollected all of the X Series available from there simply because I enjoyed the series so much. There is one common element in all the X Series games besides the whole space element and that is that Egosoft typically releases the game unfinished. Most of the required content is there, but they don’t really stop the major developments of the game at the initial release. Sure, that makes it a little rough around the edges at first but it also means that you have something to look forward to as the game is constantly evolving for quite some time after release. There is a major patch coming somewhat soon which will add a fairly large amount of new content with no extra charge attached to them. This really means that Egosoft isn’t just releasing an incomplete product and then selling you the rest as downloadable content, it means that they are freely giving you the rest of the game so you will have the best possible experience you can enjoy with it. They will also be releasing actual downloadable content in the future but that should add stuff that goes beyond the original scope of the game. 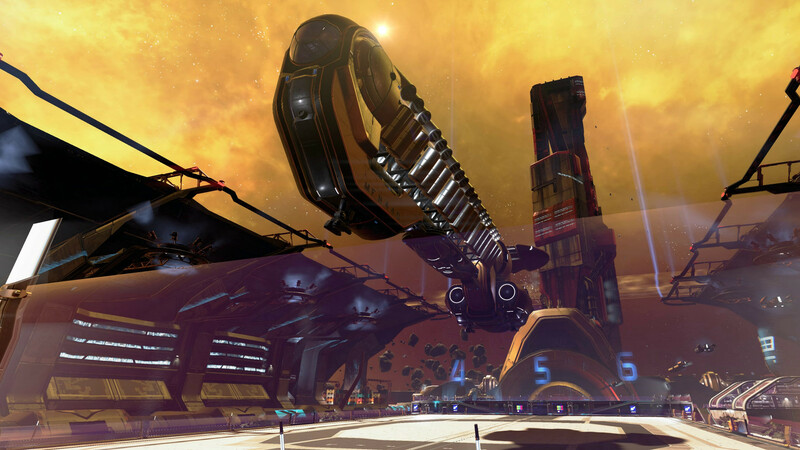 X4: Foundations is an Action, Space Simulation game. There are many ways to describe the game, but I think that Egosoft actually said it best back when they released X:Rebirth so I will quote them. “Trade, Fight, Build, Think… in the X Universe – the biggest sandbox this side of the galaxy.” That pretty much sums up what you will be getting yourself into if you pick up any of the X series of games. There are story elements shared between the games, but you can easily pick up any of the games and start playing it from there. 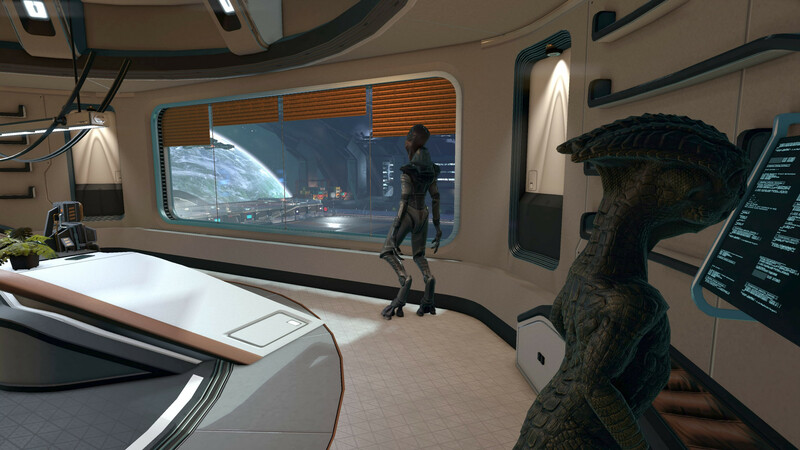 If you were to start with X4: Foundations, you might not understand some of the references it makes, but that doesn’t hinder the game at all as the in-game encyclopedia does a reasonable job filling in some of the gaps or questions you may have. I won’t go into detail about the story because the X series isn’t exactly about the stories. The story is just there to help you progress through the game in a logical fashion and gives you a little taste of almost everything the game has to offer. The story you could say is simply the tutorial for the sandbox game. It’s a long tutorial that will probably take you a significantly long time to finish, but it really is just the beginning of the game. Let’s go for the action now and jump right into combat. All the real fighting in this game is in space. 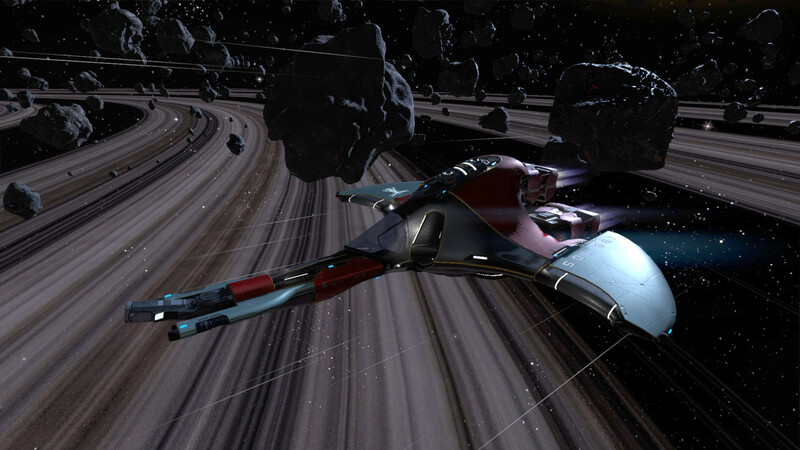 You control your ship and get into dogfights on a three dimensional plane. You need to pay attention to the X, Y and Z axis as you fly and strafe around trying to blow the enemies into space dust before they do the very same to you. Now you might be thinking, why fight when I can just boost out of there and live to see another day? There are many reasons to fight! The first is the fact they may be your sworn enemy and will hunt you down, possibly with reinforcements, long before you can make it to the highway to get out of the area. Secondly, it’s a great way to get stuff. You blew up an enemy near a friendly station? That station thanks you for your help and bravery by boosting your reputation with their faction and pays you some credits. Not only that, often when the enemy explodes they dump their cargo for you to claim. That cargo might contain items you can sell or craft into something useful. More on crafting later when we talk about building. Additionally, you could “borrow” their ship if you do it right. You can hail someone and tell them to surrender or other times they might bail out of their ship after you rocked it with your lasers. If it is a larger ship, you can launch a boarding raid against it if you have the right crew members. Once the ship is unoccupied you can commit grand theft spaceship and add it to your armada. That’s right; you are not alone in space! You can build up your own fleet of bought, stolen or salvaged ships. There is power in numbers, so having your own personal security force flying in formation with you, although not guaranteed, will likely tip the scales of fortune a little more in your favour. 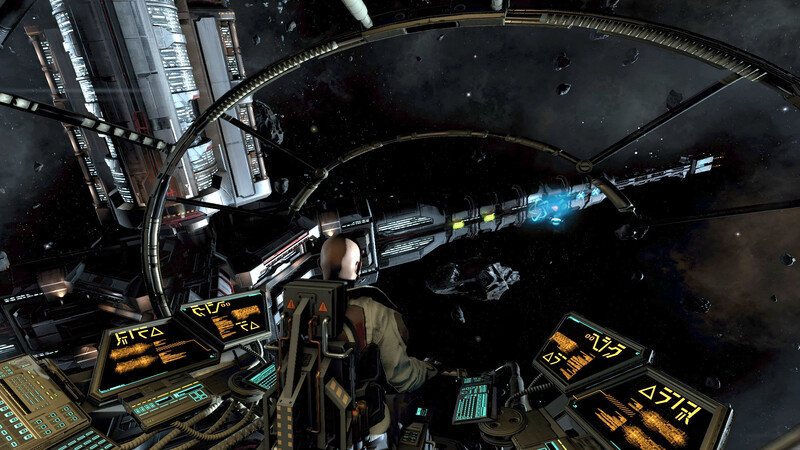 Trading is one of the ways you can acquire and build up your hard-earned credits in this game. You go to one station, find and obtain acceptable merchandise then take the goods to another station that is willing to pay you more for the items than what you paid for them. You could just fly your own ship from place to place, but that would be highly ineffective. Trade ships, especially a nice fleet of trade ships, is the most effective way to trade. You can have your trade fleet follow you if you want, or you can just order them to go to a station and collect the goods you want and then have them go to another station to unload the cargo while you are off questing or looking for hidden treasures. Since the game can handle the inner workings of each of the sectors even when you are not in the area, it makes the game far more interesting. You cannot just randomly send out a small or even an extra-large unarmed trade ship and assume it will make it to its destination in one piece. You might be able to avoid the pirates this time, but nothing says you will be so lucky next time. 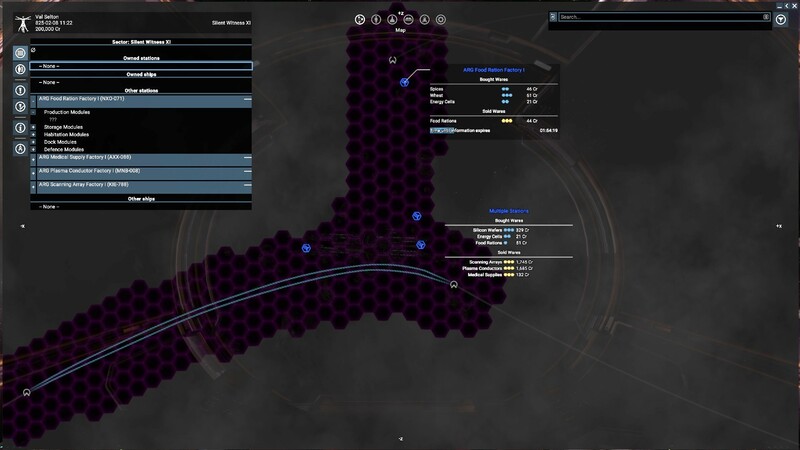 You likely should send some fighters with your trade ships to help them survive their journey. Luckily, in a similar fashion to how you assign a ship to follow you, you can assign a ship to follow the orders of another ship or station. 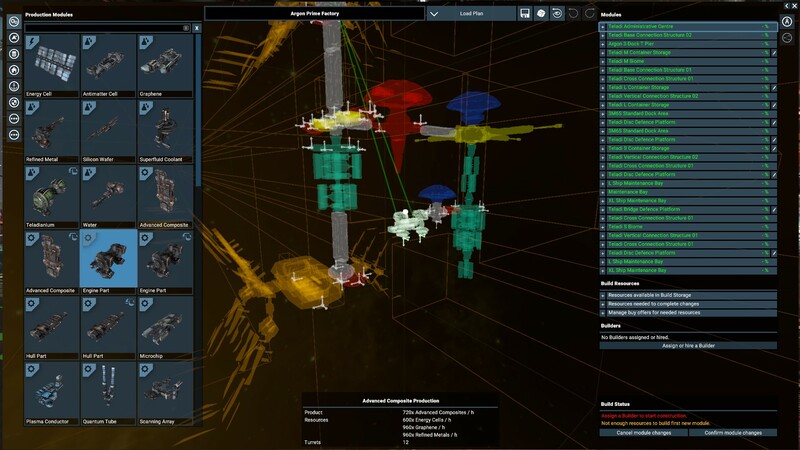 This allows you to confidently make fleets of trade ships knowing that in most cases they will fly safely along surrounded by their armed escorts. Buying and selling goods is a practical way to earn a living, however that involves you basically buying something in the hopes of selling it for a small profit elsewhere. You might not earn all that much for a small amount, but in bulk it tends to be worth your while. Just stop for a moment and think… what if you didn’t have to actually pay for the goods you are selling? That would definitely pad your profits! There are two ways to go about achieving this lofty goal: The nice way and the “fun” way. 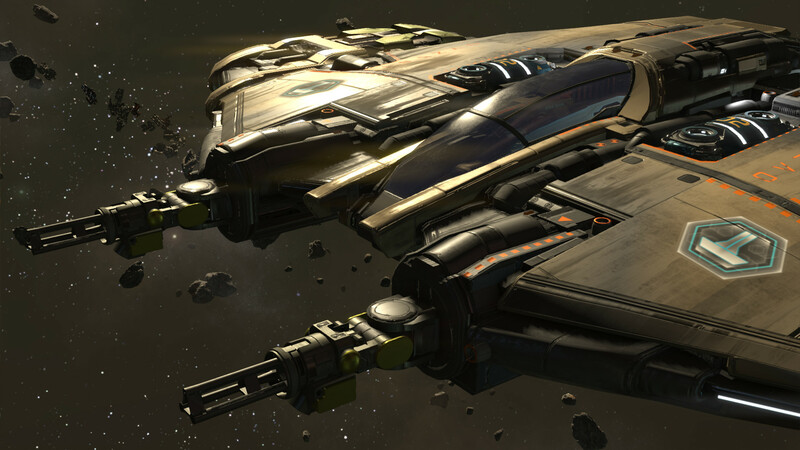 The nice way involves procuring a mining ship for your own use. 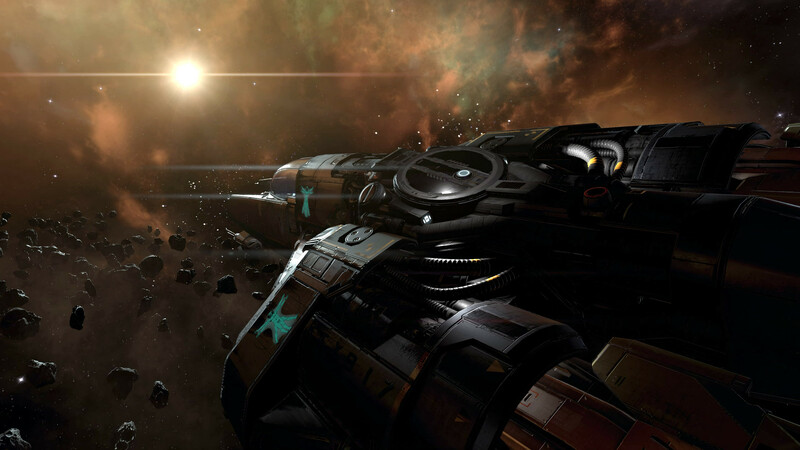 Once you have your mining ship, you can set it to mining the asteroids for their precious bounty. If the ship is assigned to a station it will ensure a steady supply of the mineable resources which the particular station requires. The “fun” way is piracy. Find a cargo ship that is already filled with goods and take it for your own. Arrrrgh and avast Matey! You may not fly the skull and crossbones but the effect is the same. Blast a few holes in the cargo ships hull and collect the loot, scare the pilot out of the ship or board it and kill your way to ship ownership. The last thing I want to talk about during this trading section is the economy. You can tell this is where Egosoft spent a lot of time. While the AI might have its quirks here and there and the user interface can be a bit convoluted, the economy in this game works well. Originally there were a few small issues with it but as of the current patches, the economy is very much alive again. For the most part, all major factions get their stuff the same way as you do. They build what they need, mine and transport resources and basically grow organically over time. If you trade with them, they will gain their resources from you. If they have need for something, they will pay more for it, but you can over-saturate the market thus reducing the trading value of goods. You do have to be a bit careful as you trade resources for credits or other resources and be aware that your buying power will fluctuate over time. I’ve touched on this already, but let’s talk about it properly now. Building is an interesting and painful element of the game. You can build ships at shipyards if you can’t find another more creative way to acquire the exact ship design you are looking for. This will take time and a whole pile of credits, but in the end you will get a sparkling new ship that isn’t figuratively full of weld marks and laser burns. However, why go to the bother of building another ship for your fleet when you could easily just take someone else’s ship? You know what would be far more interesting to build? That’s right, your very own space station! You can build a wide variety of space stations in this game. Each one requires you to have the necessary blueprints. 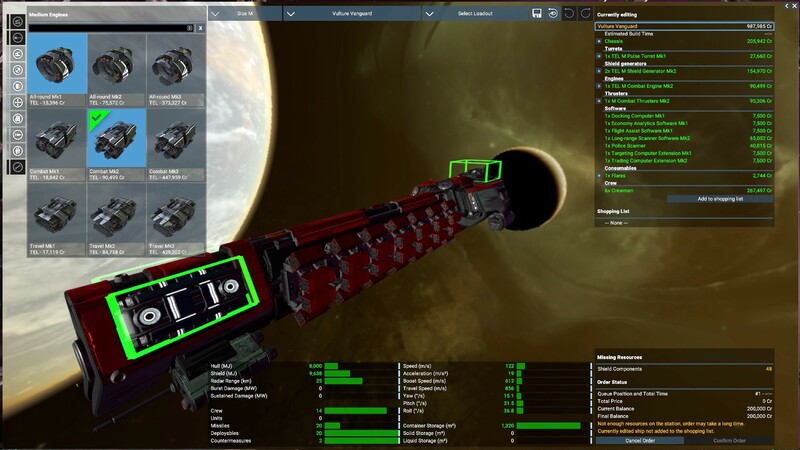 Not only can you build the space stations, you can also customize them as well. 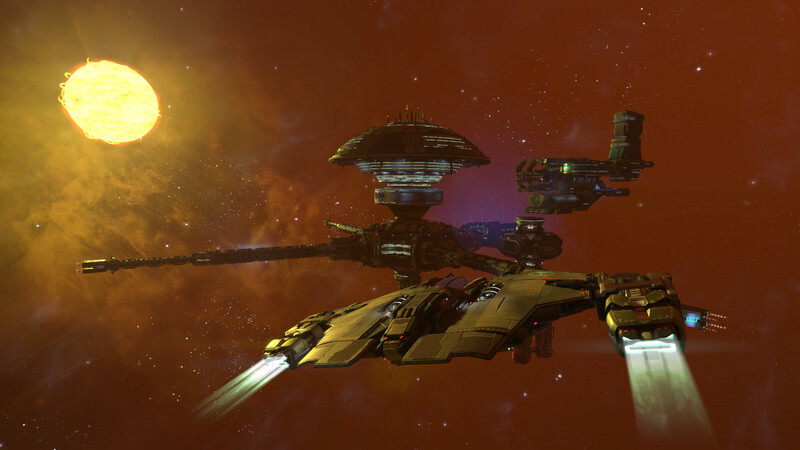 During the initial build you can opt to arm the station so if any pesky pirates or enemies come too close the station can defend itself, but even after it is already completed you can still expand its capabilities. 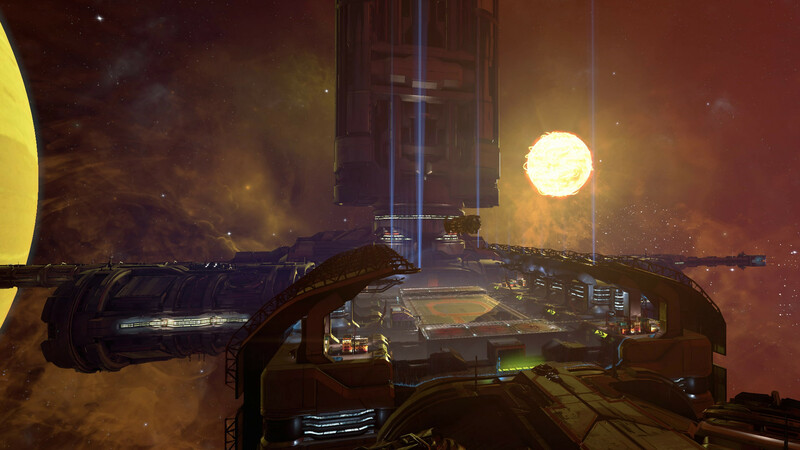 Expanding the base adds new modules to it and allows the station to be even more effective. Here is where the painful part comes in. Building a station is incredibly expensive and resource intensive. Even a basic station is still going to cost you millions of credits. 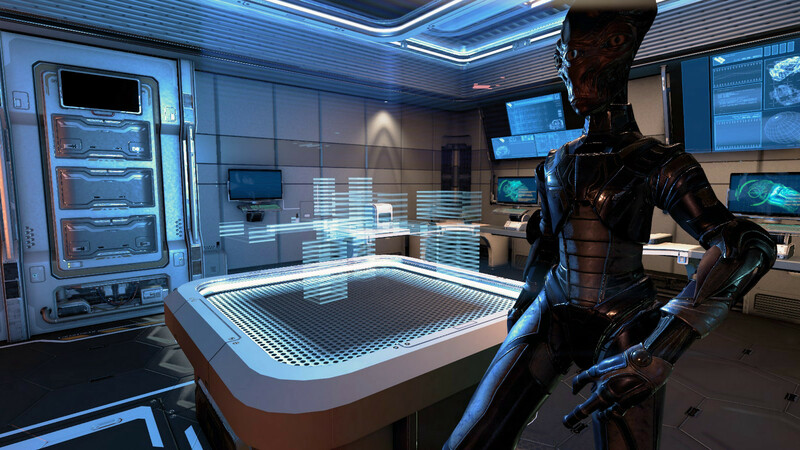 Fortunately, though if you do get a station up and running and then self-sufficient so you no longer need to buy resources for it, you will start turning a profit and regenerating those lost credits as income. Once you build up enough credits, you can then build and another and another until you are swimming in credits. Besides just building stations, you also have the ability to turn some items into other items at crafting benches. These benches allow you to make the various items you may need to aid you in your endeavors. If you can’t find the exact item you need, it might be easier to see if you can find the items needed to craft it. This method is especially useful if the item you want is not exactly legal! Depending on the station you are at, you will also be able to retrofit and upgrade your current ship. There is a wide selection of components available for you to choose from in order to customize your ship exactly how you want it to be. Generally, there are different classes of the same component as well as tiers. A higher tier in the same class is typically better that the previous in every regard, however, a higher tier in a different class might actually be detrimental in some areas but much more positive in others. You need to pay attention to each component and figure out exactly what it is you need to have most. For example, you can get an engine better suited for combat maneuvers or a nice speedy engine for more efficient exploration. Let’s talk about the exploration elements of the game. There are plenty of things for you to do in this game as it is mostly a sandbox for you to play in. Using the various means at your disposal, you can explore all the different sectors of the galaxy. Doing so will let you discover new stations and opportunities for yourself to make a profit or to upgrade your ships/stations. While you are exploring you will also encounter lock boxes that you can carefully open to release their precious cargo (without having to pay real money out for a key), or if you are really lucky you may even find some derelict ships floating out in space that you can take for your own. 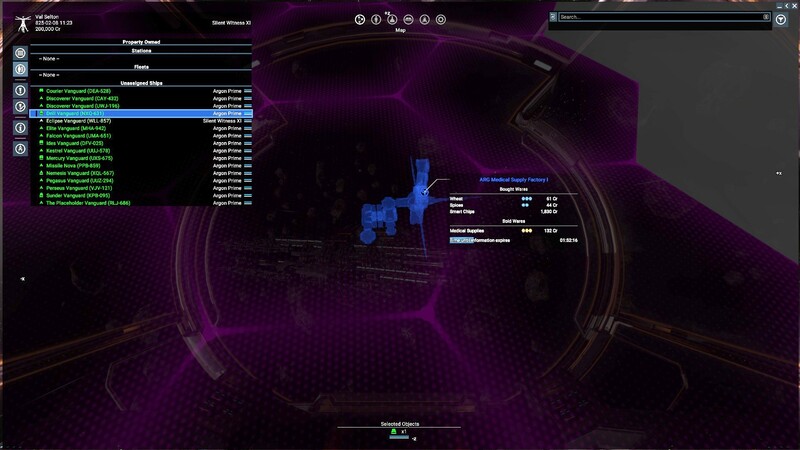 Using your ships scanners will help you spot things you may have otherwise missed by adding a ping mark to anything that falls in range of your scanners. Traveling though space can be dangerous and a bit tedious at times especially if you are jumping between stations because you forgot to pick up that blueprint you needed last time you were there. Fortunately, if you have done your Research, you can actually teleport between various places you have been. There is another way to do things faster in this game as well, and that is not do it yourself at all. If you have other crewed ships in the area you can often order them to do the tasks you need to do and then just sit back and collect your rewards. The ability to command your fleet remotely is a very handy tool I often found myself taking advantage of. You are not trapped inside your ship. You can go outside of it either while in space or while docked at a station. Exploring a station on foot can be fun and interesting. You can engage in small talk with the various personnel around the station. This allows you to upgrade your rank, hire people to work for you or generally learn a little information. While walking around you can also hack stuff. Hacking allows you to give yourself more of a discount or unlock new goods, slowdown production of a competing product, acquire new blueprints without paying for them or various other useful things. The thing is, if you are caught hacking, especially if you used an EMP bomb to do so, the locals will not be too pleased with you. Even if you are not caught, typically the station will not be friendly with you for a while. The Factions system in the game really forces you to think about the consequences of your actions. 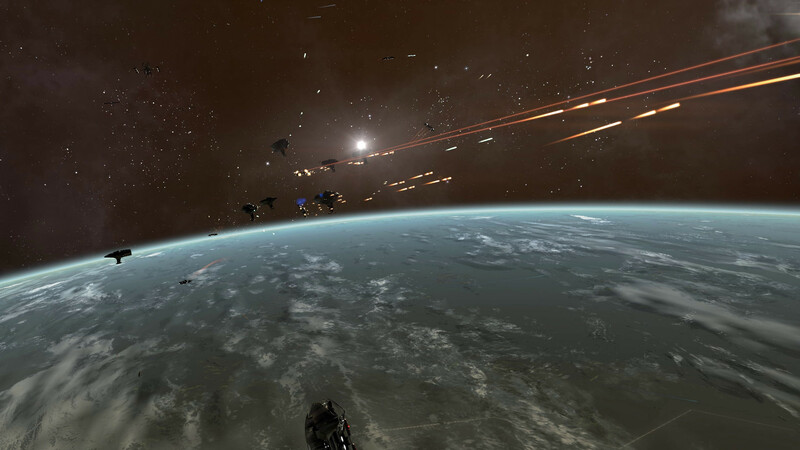 Sure there might be a nice undefended cargo hauler nearby, or maybe that capital ship would look nice in your personal fleet, but attacking an ally will lead them to no longer wanting to be your ally, in fact, they just might hate you and try to kill you on sight in the future! Luckily you can somewhat easily mend any bridges you burned in the past just by doing nice things for the upset factions. Another reason why you want to keep in their good books is because depending on how high your reputation it affects the prices at that faction’s station as well as what the stations can offer you. Before we talk about the graphics, I need to mention one thing. This game requires Vulkan, so if your system can’t support that, then you will not even be able to launch this game at all. Graphically, I have to say this game is a mixed offering. In space, the ships all look nice, that stations and backgrounds are all interesting and even some of the characters look quite good. In some cases, the characters look a little dated despite it being a new engine, but overall you can probably look past that. There is enough variation in themes that you can usually tell where you are without having to look at your map too closely. Part in parcel with the graphics is the User Interface (UI). The UI in this game is a bit of a nightmare to use. It isn’t very attractive looking and it isn’t laid out all that nicely as there are menus, within menus, within menus, within menus and sometimes it is a little overwhelming to find exactly what you are looking for. Additionally, the tutorial is basically a box that floats awkwardly and looks completely out of place that tells you what you need to do. It goes away fairly quickly so if you are not paying enough attention you will likely have to restart the tutorial if you need to see that particular box again. The X Series has never really had that user friendly of an UI so I was expecting that from X4 as well, and I didn’t really mind it that much. Between the kind of user-unfriendly tutorial and complex UI this game might be a bit off putting to someone brand new to the series. The sound effects in the game work very well and do not sound forced. The special effect noises seem natural and not staged. You may snarl at the sound of the hull of your ship creaking and scraping as you are bombarded with enemy missiles and weapon fire. Worse yet, you may groan at the dull echoing thud when you manage to crash your ship into a space station because you were too busy checking out that juicy looking cargo ship rather than paying attention to where you were going. Even the soundtrack in fact fits this game and you never actually get tired of any of it. I wish the game would have used its sound effects a little more because sometimes the game seems a little quiet, but I suppose in space there really aren’t any sounds to be regularly heard. If you read other reviews/comments about this game, keep in mind a lot of them were likely written when the game first launched. Egosoft has been quite active in patching the game and with the addition of new features. Many of those early complaints have likely been addressed by now, but there are still a number of bugs present in the game. A major patch was recently announced that will be coming soon so likely even more of those bugs will be squashed in the near future. 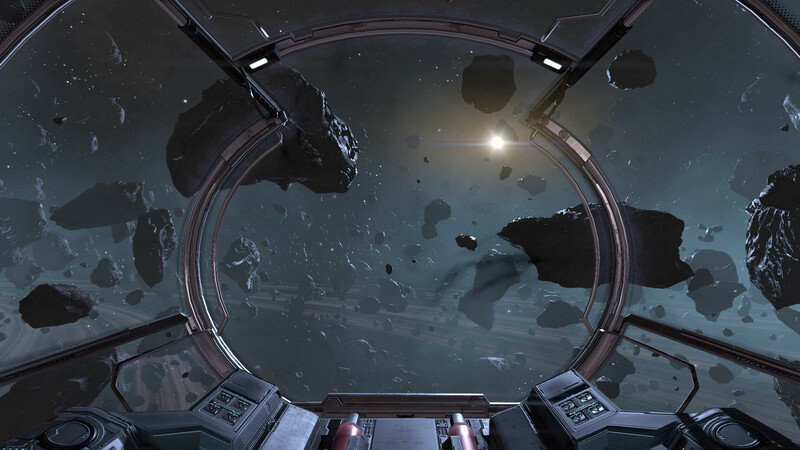 One thing that currently happens far too frequently is clipping into a station or capital ship and either passing through it or getting a bit stuck. The game also takes a fairly large amount of time to launch or to load a save game, but this could just be related to the fact my computer is starting to get a little old. If you consider how much stuff this game has going on for it, it is understandable and somewhat forgivable that a few bugs can slip through the cracks. Some of the missions are a little silly and some of them can be a bit painful, but for the most part I enjoyed my experience with this game. So, should you get this game? Well if you have played the previous games in the series, then I would say yes you should pick it up. Perhaps you might want to wait until it is more complete with its upcoming expansions first though. It is a worthy addition to the X series that I am always happy to see being expanded. If I could only play one of the X games again, I would probably choose X3 and its expansions. It feels like a much more solid and complete game, which is completely understandable since it has been out for quite some time now and the development cycle is now complete for it. 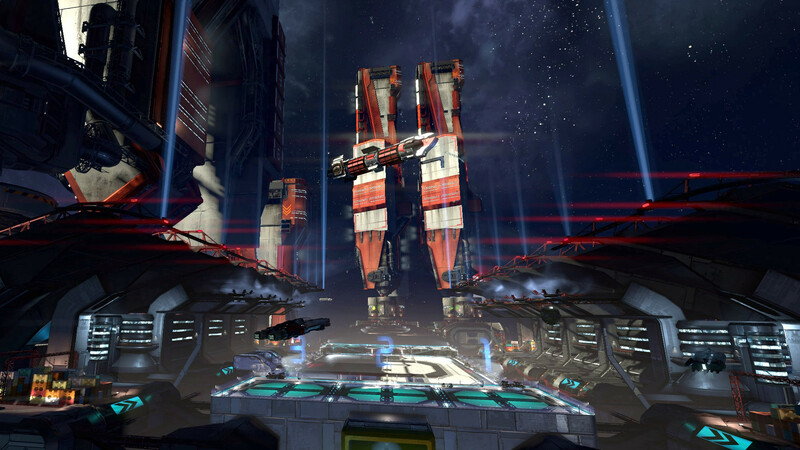 Getting back to X4: Foundations: if you are looking for a space exploration game, you should pick it up as the visuals in the game are rather well done and you will enjoy yourself as you explore the galaxy looking for hidden treasure or just cruising about. If you want a trading simulator, then again, I would suggest you get the game as it has a really in-depth and involved economy. If you like playing as a pirate but are afraid of or just tired of the ocean, then you should definitely pick it up as well as it can be quite a bit of fun plundering ships and booty. If you tend to get frustrated easily or prefer a game where you don’t have to think too much, maybe you might want something a little easier to navigate with a more user-friendly interface. 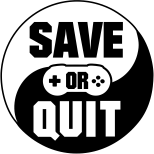 Since the game is still being actively developed and likely will evolve into an even greater game down the road, you might want to save this one for later.